If “the focal conflict model” could be described in a picture, this is it. 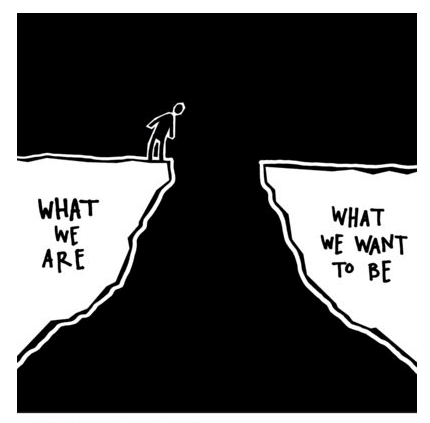 The black abyss shows the depth of the concept, and “We” that it is often something we share. The group is larger than the sum of its parts and can have its own disturbing motives. Here is a link to the original analytic paper about these matters. 1 Stay put – restrictive. Addresses the fear but not the wish. 2 Leap – restrictive. Addresses the wish but not the fear. An athlete might make it. 3 Build a bridge – enabling. Addresses the wish and the fear. As much to remind myself as anything :).